Sampling is the foundation of all research. Reliable sampling helps you make business decisions with confidence. To learn how we make sure every sample yields results you can count on, read this detailed explanation by a MaCorr sample size methodology expert. The first is deciding what kind of people to interview. Researchers often call this group the target population. If you conduct an employee attitude survey or an association membership survey, the population is obvious. If you are trying to determine the likely success of a product, the target population may be less obvious. Correctly determining the target population is critical. If you do not interview the right kinds of people, you will not successfully meet your goals. The next step is to decide how many people you need to interview. Statisticians know that a small, representative sample will reflect opinions and behavior of the group from which it was drawn. The larger the sample, the more precisely it represents the target group. However, the rate of improvement in the precision decreases as your sample size increases. For example, increase in sample from 250 to 1,000 only doubles the precision. You must make a decision about your sample size based on factors such as: time available, budget and necessary degree of precision. There are three factors that determine the size of the confidence interval for a given confidence level. These are: sample size, percentage of sample that picked a particular answers and population size. The larger your sample, the more sure you can be that their answers truly reflect the opinion of the population. This indicates that for a given confidence level, the larger your sample size, the smaller your confidence interval. However, the relationship is not linear (i.e., doubling the sample size does not halve the confidence interval). Your accuracy also depends on the percentage of your sample that picks a particular answer. If 99% of your sample said "Yes" and 1% said "No" the chances of error are remote, irrespective of sample size. However, if the percentages are 51% and 49% the chances of error are much greater. It is easier to be sure of extreme answers than of middle-of-the-road ones. When determining the sample size needed for a given level of accuracy you must use the worst-case percentage (50%). You should also use this percentage if you want to determine a general level of accuracy for a sample you already have. To determine the confidence interval for a specific answer your sample has given, you can use the percentage picking that answer and get a smaller interval. How many people does your sample represent? This may be the number of people in a city you are studying, the number of people who buy new cars, etc. Often you may not know the exact population size. This is not a problem. The mathematics of probability proves the size of the population is irrelevant, unless the size of the sample exceeds a few percent of the total population you are examining. This means that a sample of 500 people is equally useful in examining the opinions of a state of 15,000,000 as it would a city of 100,000. For this reason, the population size is ignored when it is "large" or unknown. Population size is only likely to be a factor when you work with a relatively small and known group of people (e.g., the members of an association). The confidence interval calculations assume you have a genuine random sample of the relevant population. If your sample is not truly random, you cannot rely on the intervals. Non-random samples usually result from some flaw in the sampling procedure. An example of such a flaw is to only call people during the day, and miss almost everyone who works. For most purposes, the non-working population cannot be assumed to accurately represent the entire (working and non-working) population. Confidence interval is the plus-or-minus figure usually reported in newspaper or television opinion poll results. For example, if you use a confidence interval of 4 and 47% percent of your sample picks an answer you can be "sure" that if you had asked the question of the entire relevant population between 43% (47-4) and 51% (47+4) would have picked that answer. Confidence level tells you how sure you can be. 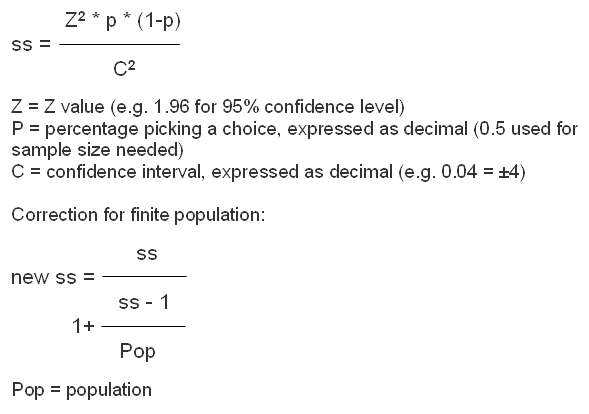 It is expressed as a percentage and represents how often the true percentage of the population who would pick an answer lies within the confidence interval. For example, 95% confidence level means that if you had conducted the same survey 100 times, 95 times out of 100 the survey would have yielded the same results. When you put the confidence level and the confidence interval together, you can say that you are 95% sure that the true percentage of the population is between 43% and 51%. The wider the confidence interval you are willing to accept, the more certain you can be that the whole population's answers would be within that range. For example, if you asked a sample of 100 people in a city which brand of cola they preferred, and 60% said Brand A, you can be very certain that between 50% and 70% of all the people in the city actually do prefer that brand, but you cannot be sure that between 59% and 61% of the people in the city prefer the brand. Try our Sample Size Calculator for yourself here!